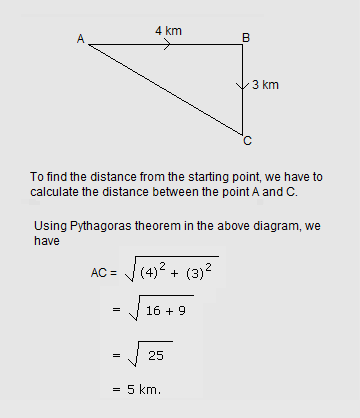 Distance Sense Test - Logical Reasoning Questions and Answers. Questions related to Distance Sense Test are asked in various competitive examinations conducted by SSC, UPSC, PSC, LIC, GIC, Railways, IBPS, etc. The main objective of these questions is to test the candidate's ability to identify the distance and direction in respect of a person who has moved in different directions from his original position. Ravi drove his car 4 km in east direction. He turned right and went for 3 km. How far is he from the starting point? 1. Rahul travelled from a point and straight to Y at a distance of 90 m. He turned right and walked 40 m, then again turned right and walked 70 m. Finally, he turned right and walked 40 m. How far he is from the starting point? 2. Kunal and Vikram start from a fixed point. Kunal moves 4 km to the South, then turns left and moves 3 km. Vikram moves 3 km towards West, then turns right and moves 4 km further. How far apart are they now? Answer - (c) 10 km. 3. A man drove his car 5 km towards eastward direction. He turned right went for 3 km, then he turned west and drove for 1 km. How far is he from the starting point? Answer - (a) 5 km. 4. A man walks 10 m in front and then walks 10 m towards right. Again turning to the left each time, he walks 5m, 15 m and 15 m respectively. At present, how far is he standing from the starting point? Answer - (d) 5 m.
5. Naseebah runs for 10 km in the eastern direction. She then turns left and starts walking for 6 km. Again, she turns left and starts running for 6 km. Then she turns left and walks again for 6 km. How far is she from the starting point? Answer - (c) 4 km. 6. Rama travels 10 km towards the north, turns left and travels 4 km and then again turns right and covers another 5 km and then turns right and travels another 4 km. How far is he from the starting point? Answer - (c) 15 km. 7. Mira starts at point T, walks straight to point U which is 4 ft away. She turns left, at 90° and walks to W which is 4 ft away, turns 90° right and goes 3 ft to P, turns 90° right and walks 1 ft to Q, turns left at 90° and goes to V, which is 1 ft away and once again turns 90° and goes to O, 3 ft away. What is the distance between T and O? Answer - (d) 8 ft.
8. Seema walks 30 m North. Then she turns right and walks 30 m then she turns right and walks 55 m. Then she turns left and walks 20 m. Then she again turns left and walks 25 m. How many metres away is she from her original position? Answer - (b) 50 m.